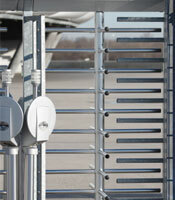 As a significant first line of defense, turnstiles or baffle gates enforce entry traffic to one person at a time. These turnstiles can also be controlled by card access. Special turnstile security gates can accommodate wheelchairs or other mobility issues, and can be designed to allow two people to enter at one time.